D o you remember Alien Breed? Yes, of course you do, it got a Gamer Gold way back in January and for a long time it was a firmer-than-firm favourite in the Gamer office. Now from Team 17 comes Project X, a no-nonsense shoot- 'em-up, and thank God it's got absolutely nothing to do with that bobbins film of the same name, starring Matthew Broderick. I don't know whether you realise this or not, but there hasn't been a decent shoot- 'em-up for the Amiga since Xenon 2. Maybe it's because the whole games industry thought that Xenon 2 was just so good it couldn't be bettered - boy, how wrong they were. You take a walk down to your local arcades and what do you see but a whole lorry load of shoot-'em-ups, most of them of very high quality. You spend your ten pennies (well, it's 50 pennies these days), go home to your Amiga, and any shoot-'em-up you player after that pales in comparison. Team 17, a highly intelligent bunch of lads, had the idea for doing a "classic" shoot-'em-up because they too were disappointed with the state of the current crop. So off they went into their dark cupboards for months on end, writing and play testing, until Project X was born. The major difference between Project X and other shoot-'em-ups is that Project X is 1 meg only, so that means more memory for better graphics and sound and, of course, almost every Amiga owner nowadays has 1 meg or more squidged in their machine. So the question that begs to be answered is "Is Project X any good?" Well, I'm going to keep you in suspense over that one, because every shoot-'em-up has a awful story to go with it. Project X being no different. Some stupid scientists were messing around doing bio-mechanical experiments using some pretty powerful X-rays when they created some massive mutated insect-like droids. It was a severe case of "Oh dear, we seem to have created some vicious mutated insects. Let's dump them on the planet Ryxx and hope they degenerate and fade out of existence". Of course, things don't run true to plan - the insects not only survive but thrive. Their computer intelligence circuits are corrupted and they set off seeking revenge. You work for the space federation, and you're assigned to deal with the mutant insects - surprise, surprise! Your mission is to fly to Ryxx, in the heart of the station where the evil insects have made their lair, and blow the whole thing sky high.. I don't really need to explain how to play the game - it's fairly obvious - but for the slightly dim I will explain - very briefly. 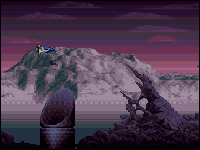 It's a six-level sideways scroller like R-Type. You control a ship and shoot waves of insects with your guns, which can be powered up by collecting pills. There you go, simple as pie. Overall Project X is one of the finest, if not the finest shoot-'em-up available on the Amiga. It's got mouth-watering graphics, and except for the bonus stages, all the graphics are in 32 colours. Sound-wise, your ears are going to take a real battering. It all kicks off with a brilliant rave tune, which pees all over the offerings from Oceanic and Altern 8. If you hate rave music then there is a unique "old timer" mode, where your ears will mellow out to some soothing flute music. In the game there is no music, but there are thousands - well, dozens - of sound effects and a fantastic array of digitised speech throughout the game. It's as addictive as something quite addictive indeed. Words don't really do Project X justice - you have to see it to believe it. I suggest you run to the shops and buy it, and if you haven't got any money, steal it - in fact, get this game any way you can. Absolutely brilliant graphics. It's console and arcade quality. Mega rave tune at the beginning with good speech and sound FX in the game. Project X is the only shoot-'em-up you'll ever want to play. It's a fairly hard game, but there's a rookie mode for the weaker players out there. 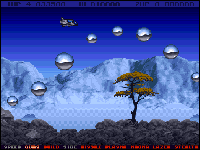 There has been a distinct lack of high-quality scrolling shoot-emups, the last one that really sticks in your mind was SWIV, it certainly had the entire Amiga Format offices enthralled. Even with its impressive array of add-ons, it still remained completely smooth and perfect. So, following in the likes of R-Type 2 and Z-Out, Team 17 have decided to have a go at their own scrolly shoot-em-up and they've called it 'X'. The plot is rudimentary: you take on the part of a pilot who controls a spaceship (various models, depending on your forte; speed or armoury). Your mission is to save the planet Ryxx, which has been infested with the usual concoction of alien and bad guys. Power-ups appear as you obliterate each alien ship, these can be utilised with a depress of the space-bar or a sideways waggle of your joystick. These are traded for various weapons: homing missiles which randomly seek and destroy; a plasma laser - yellow and deadly; sideshots are superb for zapping aliens who think they are just going to pass you by; speed - this can be a hindrance if you're not a competent pilot; magma at full power is a lethal weapon and a whole host more which will help you deplete this poor alien race. If all these power-ups aren't enough, and you crash and die, then you start off again at more or less the exact point where you just died. Unless of course you've lost all four lives then it's back to the first part of your scrolly mission. The graphics are incredibly well drawn and create their own ambience. They do let themselves down at times though; when you've worn out your joystick fingers by hammering away at those final end-of-level guardians, you aren't rewarded by the 'Pow' factor when they finally explode in the same way that you do with games like SWIV. Believe it or not, this game has four disks. Why on earth is this the case when the likes of R-Type seem to manage quite happily with one. Well Team 17 have aimed Project X at giving you VFM, so four of the blighters give you more levels than you shake a big stick at. After completing a level, which is no easy feat, it's time to change disks and move on to the subsequent level. The only tiresome part of the loading is the intro, which is about as interesting as a message from your cashpoint as you wait for your readies. The more you get into the game the more you begin to notice the resemblance to Nemesis. The game does seem dated and although the graphics and the backdrop are pleasing, there isn't anything here that distinguished it from the rest of the shoot-em-up crowd. The game may enthrall you for a few hours, it certainly proved a popular blast for those in the office who were born of frustration and wanted a quick 10 minutes (which soon turned into 60) of power-ups, wild screens and mothers of all guardians to zap their way through. But, if any other decent shoot-em-up had been lying around there would be no good reason to make you plump for this one. It would have been nice to see a simultaneous two-player mode, and maybe something unique to Project X. As it is, the only new thing Team 17 have brought to the genre is the longevity of the whole experience. This is no bad thing, but these days you have to do something more pioneering to make a name for yourself in this industry. If you get bored of the Old Timers theme tune you can plump for the Rave tune. Comes complete with four alien-infested disks, painful intro screen though. You certainly get your money's worth in terms of gameplay. Plenty of lurid and ambient backdrops. Verständlich sind gewisse Vorbehalte natürlich schön, denn Ballerspiele fur den Amiga gibt's wie Monster im Dungeon - und die meisten sind die Disk nicht wert, auf die sie gepresst wurden. Bei Projekt-X liegt die Sache aber gottlob anders, auch wenn man das bei der erschreckend einfallslosen Vorgeschichte um mutierte Droiden, die einen Planeten besetzt halten, gar nicht vermuten wurde. Anderseits, wer braucht schon eine Vorgeschichte? Schreiten wir also zur Action, alleine oder auch zu zweit hintereinander. Es stehen nicht nur drei verschiedene Raumgleiter zur Verfügung, sondern einiges mehr: Ihr möchtet automatisches Dauerfeuer? Oder im Titelbild lieber sanftem Weltraumgedudel lauschen anstatt des Techno/Rave-Mix? Kein Problem, selbst die Startlevel ist einstellbar, falls man vorher entsprechend weit gespielt hat. Ist man erstmal im All, geht auch gleich die Post ab: ihre Kreise, Meteoriten rauschen in Massen vorbei, der Zwischengegner lässt einen wahren Kugelhagel vom Stapel - man ist stets in Gesellschaft von zumindest einem Dützend Sprites! Umso erstaunlicher, daß Project-X den Spieler mit unfairen Stellen belästigt, das Game bleibt wirklich von vorne bis hinten spiel- und schaffbar. Ware ja auch zu schade, wenn man die imposanten Endgegner, die wunderschonen Lava-Welten oder die "R-Type"-station nie kennen lernen wurde! Auch die Bonuslevel sind durchaus einen Blick wert, hier wird in einer Temp-Tunnelpassage das Punktekonto aufgebessert. Das Extrawaffensystem erinnert an "Apidya": Man sammelt Symbole auf, um so an leckere Speed-Ups, Schützschilde oder diverse Laser-Kanonen zu kommen, die sich (falls vorhanden) auch über einen zweiten Feuerknopf aktivieren lassen. Aber aufgepasst, nach jeden neu angebauten Extra reagiert der Raumer ein Stück träger auf die Joystick-Kommandos! OK, das nimmt man in Kauf, wenn die Extrapower so imposant aussieht wie hier. Imposant ist aber auch der Rest der Grafik, die ruckelfrei und farbenfroh von rechts nach links (bzw. ein wenig nach oben und unten) vorbeiscrollt. Die Ohren kommen während des Spiels ebenfalls nicht zu kurz, zwar gibt es da keine Musik, aber dafur reichlich FX und Sprachausgabe zu horen. Zu bemangeln findet man hier wenig, vielleicht dass die Sprites gelegentlich etwas holprig animiert sind, die Feindformationen nicht ewig Spass machen und wirklich ausgiebig nachgeladen wird - letzteres ist bei satten vier Disks jedoch kein Wunder. Project-X - endlich wieder Baller-Action, die ihr Geld wert ist! Spezialität: Lauft auf allen Amigas mit 1MB RAM, Pausefunktion, Highscores werden gespeichert, Poster anbei. After Team 17's tremendous cover demo on last month's issue of AMIGA POWER, the world at large was expecting Project X to wipe out the competition. Sometimes though, life is just a bit unpredictable (and more than a touch disappointing). Okay. Here's a little dilemma for all you budding game reviewers out there. You see a preview of a new game. It looks absolutely wonderful. You rave about it and tell everyone to go out and buy the game the second it appears in the shops. Some time later, the real thing shows up. Its not nearly as good as you'd been hoping for. Do you bite the bullet and admit you got it wrong, or do you brazen it out, rely on breathless enthusiasm to sell your earlier impression and hope nobody notices? Well, as a wise man once said. 'Admitting you were mistaken in the past is in fact no more than saying that you are now a wiser man than you used to be', and that's good enough for me. Which is something I'm afraid I can't really say about Project X. There's a forceful argument that says something that's NEARLY brilliant is often a far, far worse thing than that which is simply mediocre. The principle being that when you're just a whisker from perfection, the flaws which stop you from attaining it suddenly become drastically more important, simply because they ARE standing in the way of that perfection. They can seem to loom so large, like a particularly ugly oil refinery in the middle of an otherwise breathtaking landscape, that they overshadow the whatever-it-is's numerous good points completely and make you hate it, although objectively it is, of course, nearly perfect. You know what's coming now, don't you? Project X is nearly brilliant. Yup, Project X is nearly brilliant, which is to say that it's one of the most irritating and infuriating games you'll ever play in your life. You may be wondering why this review only includes screenshots from the first two levels. The reason is that, after three days of solid play by the entire AMIGA POWER team, not one of us got further than about halfway through level two, and that only twice. (In fact, I was the only one who made it off level one at all). This is a game so incredibly mean- spirited that if you haven't finished R-Type without cheating. I wouldn't suggest that you even try it. More than any other shoot- 'em-up I've seen, Project X is completely power-up-centred, to the extent that if you lose a life (and with it, the vast majority of your power-ups - lose two lives in a row and you're back to the weediest weaponry there is, no matter how hard you were before), you're as well to hit the abort button and start again, such is the miniscule magnitude of your chance of getting any further. This is compounded to an uncomfortable degree by two things. Firstly and less importantly, the game seems prone to an occasional bug that plays havoc with the power-up system - sometimes collecting a token can. Instead of making the weapons bar progress to the next add-on, inexplicably make it return to the first icon (speed-up). Secondly, the method of selecting a power-up is to either hit space (necessitating a lunge away from the keyboard which is ill- affordable in a game of non-stop high-speed action like this one) or to waggle the joystick rapidly back and forth Xenon-style. This is fine in theory but, as in Xenon, it proves disconcertingly easy to do it by mistake and select a weapon which you really didn't want. Switch inadvertently from an eight-times- enhanced plasma beam weapon to a poxy double-shot gun in the middle of a heavy attack wave on level two (as I did) and you might as well wave bye-bye to the whole game, all the effort expended on getting that far completely wasted. More of a gauntlet than a game to enjoy. The game does offer you a 'Rookie' skill setting, but it only lets you play the first two levels (like, thanks all to pieces), and a level select which lets you start (power-up-less) on the last level you reached, but only up to and including the third level of the game's six. Big deal. There's more, but hang on, it's nearly summer, let's try and be positive. Project X isn't short on good points. You can select one of three ships of differing characteristics for your mission, allowing you to tailor your tactics a particular way. The weapons and ship interact imaginatively, with powerful weapons both detracting from the other weapons and hampering the handling of your craft. The speech samples are atmospheric and helpful. The graphics are stunning (see for yourself), and Team 17 have listened admirably to criticism of their earlier Alien Breed, which said it was too easy to complete. Unfortunately, they've gone hurtling off in the opposite direction and made a game that only a superhuman's going to see the end (or even the second half) of, Project X doesn't even apparently have a cheat mode, so unless you're the kind of person who found R-Type II just all too easy, forget about this forever. Both games are beautiful, but Apidya scores here for detail, colour and variation. The backdrops are gorgeous and some of the enemies are utterly disgusting - Project X suffers from characterlessness. Project X has nice zappy FX and the speech adds quite a lot to the atmosphere, but Apidya's spanky music and jingles are way out in front of it. The 'Techno Party 1' tune in particular stomps all over Project X's much-touted intro music by itself and it has got an in-game tune (with FX at the same time) into the bargain. Not much of a contest here, to be honest. The effect of inertia on the various ships in Project X as you pile on weaponry is clever and 'realistic', but as we have said before at some length, arcade gamesa re no place for realism. Also, in Project X, if you lose a life anywhere past about the middle of level one, you might as well abort the game and start again. Of course, the very frustrating nature of Project X makes it addictive in the short term, but eventually you just get fed up with it. On the other hand, Apidya takes the approach of making you feel that the next bit is going to be really worth seeing - just as effective and a lot friendlier. Apidya is the way things should be done, really. Auto power-up selection (optional), catering for 2-button joysticks, lots of skill levels including a novel practice mode and a choice of when you get extra lives (very clever), the chance to listen to any of the game's music from the start screen, imaginative 2-players-at-once game, unobstrusive intro, enough continues to give you just a chance, I could go on and on. Project X, on the other hand has the 2-button joystick capability and a software autofire and that is about it. Apidya 46 - Project X 36 'Nuff said. More of a thrown gauntlet than a game to actually enjoy, at least this is something you'll get a lot of life of, as long as your own doesn't end in a high-blood-pressure- inducing heart attack first. With no cheat mode, though, I fear most people won't ever see even half of it. UPPERS Well, you can't say it's not challenging, and it looks beautiful. The five most talented arcade gamers in the country will love it, for certain. DOWNERS The insane, unfair difficulty level makes for one of the most frustrating games we've seen in ages, and the bugs and control quirks push it to the wrong side of intolerably annoying. 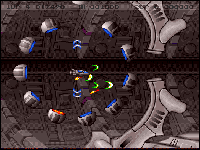 The first thing that strikes you about Team 17's new shoot 'em up is that it comes on four disks. For an out-and-out blaster this must be something of a record and certainly gives an indication as to the game's complexity. For your twenty-six quid, you get a six-level 1Mb-only blast packed with all manner of weirdo insects and deadly techno-beasts. The scenario bares an uncanny resemblance to both Gremlin's Venus and Palace's upcoming Hostile Breed in that a planet has become infested with killer bio-bugs, the result of bio-mechanical experiments gone wrong. The new and dangerous inhabitants threaten the stability of the Galactic Federation and, as their number one flyboy, it's down to you to pilot one of three prototype war planes, fly to the infested planet, and blast the mutated scum into protoplasmic mush. Once you've selected your ship, it's straight into the action. You can choose to play the first two levels in rookie mode, but the real action lies in advanced mode where the skies become bloated with some of the biggest enemy sprites you're ever likely to see. 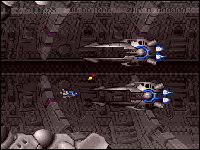 Most impressively, even when the screen is packed with enemy fighters, the action or scrolling never slows down. Each level has a distinct theme and is related enemy sprites. The first involves navigating your ship through the three deadly asteroid belts which surround the planet. Each is harder than the last and requires massive firepower to destroy the spinning boulders. Level two involves a white-knuckle ride across the ice�capped polar regions. Huge mountains from an impressive backdrop to the action and spectacular lightning effects illuminate the sky. Alerted to your presence, the bi-beasts flood the sky with some of the most bizarre enemy sprites, you're ever likely to encounter. Large snaking craft dominate the skyline together with gigantic chrome-effect missiles, buzzing bees and bouncing mushrooms. The third level is set inside a volcano and features lava flows , magma eruptions and falling rocks which make the entire screen vibrate. Deadly firebirds dive-bomb your ship and rise Phoenix-like from their ashes each time you blast them out of the sky. There's also a huge sleeping dragon to contend with. Once awoken, the massive creature litters the underground caverns with a fearsome array of firebolts. If you manage to survive the lot, the fourth level takes place inside a water-filled cavern. Half the action takes place beneath the pool's surface, but your amphibious craft can only remain submerged for a certain length of time before you'll turn a nasty colour of blue - also, once underwater, the joystick controls become sluggish as the water affects your craft's inertia. The sound effects also change when you dip below the water line to reflect the aquatic nature of your environment. Huge seahorses, tadpoles, crabs and metallic flying fish form the main opposition, as well as a superb end-of-level guardian equipped with massive pincers - to blast this baby out of the water means piloting your craft within an inch of its claws and letting rip with everything you've got. The fifth section is set deep inside the alien stronghold. As you might expect, it's incredibly well-fortified and each alien requires multiple hits before they're wasted. 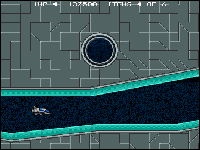 R-Type-style circular traps and multiple missile launchers lie in wait as well as an especially tough guardian which is nigh-on impossible to defeat. Finally, after destroying their lair, it's back to the planet's surface for a bombing run where your given a couple of chances to drop your deadly payload into the aliens' air ducts and send their reactor to critical mass. As you've probably gathered, Project X is a massive shoot 'em up. The horizontally-scrolling action never relents and the gorgeous 32-colour graphics complement the excellent and super-fast gameplay. 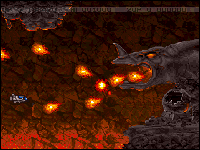 Equally hot, are the incredible sound effects which must rate as some of the best on the Amiga. From the howling wind of the second level through to the muted sound effects on the underwater section, the sonics are faultless. There's also plenty of sampled speech throughout the game, warning of oncoming alien attack waves and advising on what course of action to take. As with all such games, there are plenty of power-ups to be picked up, and Project X's are released after each alien wave is dispatched. Once collected, you then have the option to enhance the power of your currently-selected weapon or wait until you've gathered enough credits to activate another powerful armament. The ship's initial pop-gun can be swapped for extra speed, plasma and magma bolts, sideshots, heat-seeking missiles (which are obviously useless on the volcanic level! ), lasers and capabilities. The joystick controls are excellent and straightforward. 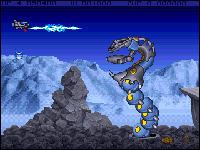 The screen slowly scrolls from left to right and stops for a time when particularly large enemy sprites appear before continuing. Power-ups are selected by waggling the joystick from side to side or by pressing the space bar or mouse. Nothing's perfect, but Project X comes close. The enemy attack waves are a tad predictable at times and a little bit more intelligence in their formations would have been a boon. I was also a bit miffed at starting the game with only five lives, especially as one hit sends you diving of the screen in a plume of smoke. It's a shame that there's no simultaneous two-player option available either, but we can't have everything, can we? It's not hard to see where Team 17's bunch of talented coders have looked for their inspiration (R-Type 2 and Nemesis fans will instantly be at home), but the finished product has been finely honed into a distinctly original product which makes other games from the genre pale in comparison. An outstanding arcade-quality blast. ARMOURED ARMADA Each ship has its own distinct advantages and deficiencies. For example, the Hunter MK7 Scout Class ship has incredible speed and stealth capabilities but can only take on board a limited arsenal. Alternatively, the Crux 11 Battle Class cruiser can carry a big payload, but is slow and sluggish to respond. The third available craft, the Hyperion, is a good all-purpose fighter with no discernible defects and no particular outstanding features either. Bolt on too many weapons to a ship and the craft will become unwieldy and difficult to control. To circumvent this, it's possible to increase the ship's speed and thus improve its stability, but then your reflexes need to be quicksilver fast. POINTS MEAN PRIZES As an added feature, there's a bonus stage bolted on to the end of each level which involves jockeying your craft through a maze-like series of tunnels. This is an extremely fast section where it's possible to rack up many points. There are also bonus icons dotted around the level. Collect six of these and an extra life is yours. Each maze is randomly selected from a number of predrawn maps so it's impossible to predict which one you'll get. Multi-level parallax and an abundance of sampled speech directing your progress make this one of the best features of the entire game. We've found a system, a brand new system, and a secret ingredient called Project X. Chief scientist Michael 'Work Experience' Squire takes Team 17's newbie down to the ZERO lab to put it through its paces. Well, they've only gorn and done it again - they've accidently brought the world to the brink of destruction. The mad-cap chaps have created massive, mutated droids, which for some reason bear an uncanny resemblance to insects. These beauties are all byproducts of a series of biomechanical experiments using powerful x-rays. Due to their volatile nature, the droids were then dumped on the planet Ryxx (named after the celebrated star of British farce, Brian). The droids not only survived and flourished on the hostile planet, but also acquired the habit of dropping their trousers and saying "Oh sorry vicar" at every available opportunity. Now their powerful intelligence circuits are telling them to seek revenge on their creators and the whole of civilisation as we know it. Understandably, the Federaton is starting to get a little hot under the collar about the prospect of annoyed droids, and is forced into action. Surprise, surprise - this is were you come in (rather like Cilla Black). Your mission is to fly to Ryxx, right into the heart of the station, and wreak your revenge on the state of British comedy by blowing the planet sky high. Mike: Project X - well, what can I say? For starters, it's a great game which is destined to become one of the bestsellers this year in the shoot'em up stakes. (Blimey! steady on! Ed.) One of the first things that struck me was how similar in playability it ws to Rainbow Arts' Z-out. It may be slightly too tricky for beginners, but hardened games players will have little trouble fighting off the alien basts. However, if you do have a problem you can always turn on the rather handy rookie mode, which makes the overall game much easier. Here the aliens are a cinch to blast, and you don't lose any of your weapons when you lose a life. The disadvantage is that you're only offered access to the first two levels. Well, waddya expect? Look, the best course of action is to use this mode as a sort of training ground, before you progress to the hard stuff. You also have the opportunity to change the so-called 'rave' music to 'old timers music' - a sort of flute tune music, which is all right but nothing out of the ordinary. The high score table features a stirring rendition of Tchaikovsky's 1812 overture and spectacular exploding firework graphics. You'll get to choose which craft you want to use from three different types of ship, all of which boast their own personal positive and negative attributes. It goes without saying that you'll be able to soup this baby up into a Carlos Fandango mutha-ship that's bristling with ordinance. Simply annihilate a wave of aliens and you'll collect a token. These tokens will move your power bar at the bottom of the screen up the scale. Choose to use, for the current boost, or save up for a better one. The digitised speech will constantly remind you which power-up is currently on offer, by the way. As for the game's graphics, well they're pretty good actually, with rather stunning backgrounds. 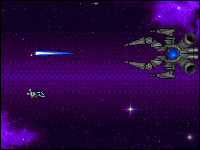 The sprites vary in size, but are well drawn and nicely animated. My main whinge is that once you've learnt the pattern of alien attacks, the game becomes quite easy, but this has the advantage that at least every time you play the game you always seem to get further. (You mean it's got a rather nice learning curve. Ed.) Er... yes. And oh, the meteoroids on the first level look really realistic. Best of all is the speed at which this horizontal scroller moves - it makes it such great fun to play. It wasn't many lunar cycles ago that I was playing the full price version of Team 17's foray into the world of space blasters. Yet, no sooner am I just getting over a bad bout of space sickness, and it's back! Now released on budget, Team 17 have trodden ground seldom trod by software houses. They've listened to the inane ramblings of the buying public and tweaked a product to suit. 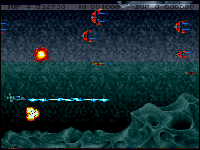 Heralded as the Amiga's top shoot-em-up. Project X has no pretensions about complicated story lines. Instead it's five levels of sizzling arcade action. The gameplay is devastatingly rapid and not at the expense of the graphics. Project X boasts some massive sprites and some of the rockets level guardians I've come up against - honestly these dudes have tattoos, smoke bitter and drink tabs! Boasting a shuttleful of features and more weapons than a Ronald Reagan peace-keeping force in Central America. Project X is a winner. Id you didn't buy it first time around you were foolish. Miss it this time on budget and you're a mutie who should be sucking vacuum in nether-space. Fasten your seatbelt, this one is going to be a rough ride. What a fine intro. 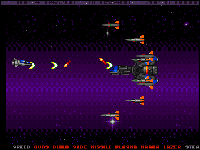 This is a shoot-em-up's shoot-em-up, a blast from the past (1992 actually) you are a rider at the gates of space, flying your craft like the wind. Bad things are happening on the planet Ryxx, with evil creatures wanting to do naughty deeds. And guess what, you are the only one who can stop them. The action comes thick and fast. There are loads of power-ups to boost your progress and these include extra speed, missiles, plasma, lasers and stealth. The latter makes you virtually invincible, though if you add too many weapons your ship can become sluggish so it's important to keep collecting the speed. This version has been tweaked slightly and has been reduced from four disks to three. Plus there's now a Rookie mode that enables novices to get to later levels. Make no mistake, Project X is a great shoot-em-up and at 13 sovs, a great buy. When we first saw this game (back in issue 13, where it scored 78 percent), we wept tears of sorrow. It had looked from demos and previews as if it was going to be the best Amiga shoot-'em-up ever, but the final version was bugged, poorly designed, and so ridiculously, stpidly, unfairly hard that playing it was simply one of the most annoying and frustrating experiences that I've had since - well, you don't want to know about that. Never before had a game been so unfriendly, so downright nasty-minded, and so unsatisfying. Several days of play failed to see any of us make any progress beyond the second level, and more importantly, failed to see any of us harbouring any desire to. It looked lovely, it sounded superb, and it was utterly hateful. Oh dear. So now it's 1993. Ever mindful of criticism, the Team 17, er, team have had another go at it. The control's been tightened up, the power-up system's a tad more generous, some of the more appallingly frightening attack waves have been taken out altogether, and Rookie Mode now lets you get all the way to level four (although you'll still have to be something a bit better than a rookie to get anything like that far). Has it worked? Is the all-new, all-dancing, all-playable Project-X the best Amiga shoot-'em-up of all time? Well, no. But it IS a darn sight closer. There are still (and let's get the negative stuff out of the way first) some irritating flaws in this game. The biggest one for me personally is the system whereby collecting big and powerful power-ups causes your ship's handling to become sluggish and inertia-ridden. Now it's all very well to say that plasma cannons are heavy and this is all very realistic, but as we've said before, if you want realism, buy a flight sim. The power-ups themselves don't seem to be very well-balanced, either - there seems to be very little benefit in collecting the really hard weapons, even when the power-up system does allow you to build them up. It's still possible to accidentally select power-ups, too - the game caters for two-fire-button joysticks, so there should have been an option to disable the 'select-by-wiggling-the-stick' feature. And finally, it always really bugged me that you don't get to see the groovy bonus game until after level two. What's the point? Only having it after the rest of the levels looks silly, quite apart from anything else. So, after that litany of hair-spitting, let's be a bit more magnanimous and reward effort and good intentions. This version IS a lot better than the original, and I managed to have a pretty groovy time with it this time around (even including getting beyond level two, in Arcade Mode at that). It's right up there with Apidya and R-Type 2 in the ranks of the top blasters, and it's one of the best tests of skill all you complacent zapsters out there could ask for. A significant improvement on the first version, and it manages to sacrifice its previous off-putting evilness without turning into a complete pushover, but Project-X still isn't realising its full potential. At budget price, though, it's well worth buying for all that. Quality is a nebulous concept. What's one man's meat is another's poison. And nowhere is this more true than in the prodigious world of Amiga shoot'em ups. Everyone's got an option concerning which game is the ultimate blast. My favourite is Team 17's Project-X, a silky smooth blast with arcade quailty graphics and electrifying gameplay. Once you've picked this up, you'll never want to put it down. Unfortunately, the original version was also quite hard, and some people found it almost impossible to get very far without getting totalled. Admittedly, I've never managed to get past level four, but that certainly hasn't kept me from trying. The lack of a cheat was a bit of an oversight (until CU provided one on its December '92 coverdisk! ), but the game did provide a tremendous challenge for those willing to invest time and effort. I should know, I'm still playing it even now! To help out those who couldn't even complete the first level, Team 17 have tweaked the gameplay to make things slightly easier. Unlike the Alien Breed Special Edition, though, Team 17 haven't added any extra levels ot included any new aliens to slaughter - they've merely listened to some criticisms of the gameplay. Sadly, they've gone too far the other way, and things are now too easy. Without losing a life, I managed to reach the start of the third level and didn't even break out into a sweat. In this new version you begin the game bristling with weapons, making the first few attack waves crumble beneath your overwhelming firepower. As you acquire more power-ups, things become skewed in your favour. Instead of losing 25 per cent of your weapons when a ship gets destroyed, you only lose one level of power-up, so you're soon back to where you started after you've scooped up the next power capsule. And that's it. There's nothing else that's new with this version of the game except that it comes on three disks instead of four. Oh, and the fact that it now costs half as much as the original at a bargain-busting £12.99. If you've never heard of Project-X before, hold on to your hats, as here's a whistlestop guide to its essential features. For starters, it's a shoot em up, pure and simple. Aim your on-screen craft in the right direction, stab the fire button, and blast all and sundry into so much intergalactic space dust. Of course, as in any selfrespecting game from the genre, there are power-ups aplenty and it's possible to bestow your craft with all manner of weapons such as plasma bolts, sideshots, heat-seeking missiles, lasers and a nifty stealth facility ro render your craft virtually undestructable for a certain length of time. Up against you are ranged a deadly collection of bio-mechanical beasts, the results of a series of failed scientific experiments. These evil creations, dumped on the planet Ryxx, now pose a threat to the rest of the galaxy. Your job as intergalactic flyboy is to power down to the planet's surface and blow the whole shooting match sky high. Set over five levels, and featuring some of the best graphics ever seen in an Amiga game, the action comes thick and fast and you need all your reflexes to stay alive.